Some of the news articles in this section are taken from external sources and web sites. Universal Leonardo is not responsible for their content or reliability and does not necessarily endorse the views expressed within them. Lovers of Dan Brown novels will be salivating at the discovery of three previously unknown drawings on the back of one of Leonardo’s major works. A curator spotted the sketches on the back of The Virgin and Child with Saint Anne when it was taken down in September for restoration. Please see the The Times Online for the full story. design, and most importantly, classroom impact. Leonardo da Vinci’s Codex Atlanticus, the largest bound collection of his drawings and writings, has been infiltrated by mold. The UL website has been nominated in the arts category for a prestigious Webby award! 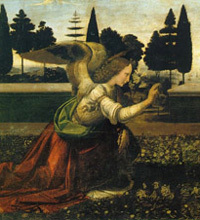 Leonardo's Annunciation travels to Tokyo amid protests. A new exhibition on Leonardo's machines, "Leonardo's workshop: from the mysterious robots to the flying machine" will open in Milan on 29 March 2007. The Universal Leonardo Web site was shortlisted for the 2007 Design Week Awards . The Universal Leonardo exhibition programme terminates with the last exhibitions closing on 7 January 2007. A Call for papers from Leonardo journal to celebrate Leonardo da Vinci. Anthropologists from the University of Chieti, central Italy, have pieced together Leonardo's left index fingerprint. The preparatory drawing for the Adoration of the Magi is on display at the Library of Congress. The most important scientific study ever carried out on Leonardo's Mona Lisa is documented in the recent book "Mona Lisa": Inside the Painting. "The Genius of Leonardo", a comprehensive exhibition of Leonardo's machines, opens in Turkey on 1st November. A conversation between artist Marilène Oliver and cardiothoracic surgeon Francis Wells, who collaborated over the sculpture "Leonardo's Great Lady", where they reflect on the experience from the different perspectives of artist and scientist. Sir Joshua Reynolds’s Mona Lisa is on display at the Dulwich Picture Gallery from 10 October 2006 – 11 February 2007. The second part of the Florence exhibition "The Mind of Leonardo" opens on 3 October. Martin Bailey reveals why Bill Gates's Notebooks are not part of Universal Leonardo's London exhibition. As part of Universal Leonardo, the Alte Pinakothek puts on show Leonardo's only masterpiece to be held in a German museum. "Leonardo da Vinci: Experience, Experiment and Design", one of the most spectaular exhibitions of Universal Leonardo, opens at the Victoria and Albert Museum, London, on 14 September. Design Taxi selects Universal Leonardo as "Website of the Day"
Students from Southbank International School take part in "The Life of Leonardo Workshop". Martin Kemp, co-Director of Universal Leonardo, speaks to artnet magazine. The first stage of the Universal Leonardo web site goes live. New computer software reveals the emotions behind the most famous smile. Five hundred years ago, Leonardo Da Vinci solved an ancient astronomical riddle: the mystery of Earthshine. Heart surgeon finds a new way to repair damaged hearts. A new masterpiece by Leonardo may have been uncovered. A new Channel 4 documentary, Opus Dei and The Da Vinci Code, goes on air.